Rhapsody on the Blue: Octopus! 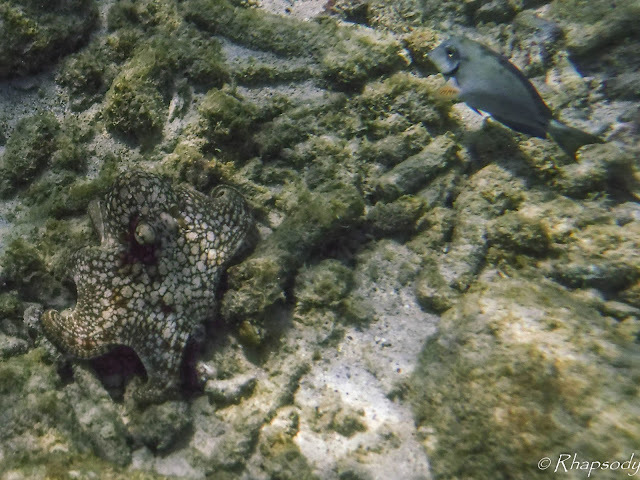 Any day that I spot an octopus is a good day. I get great joy from watching them move and change not only the color of their skin, but also the texture. Often when we are diving or snorkeling, especially in the day, and we spot an octopus we just barely see a glimpse of them in their hideouts. This little hint of pink is often all we get to see. 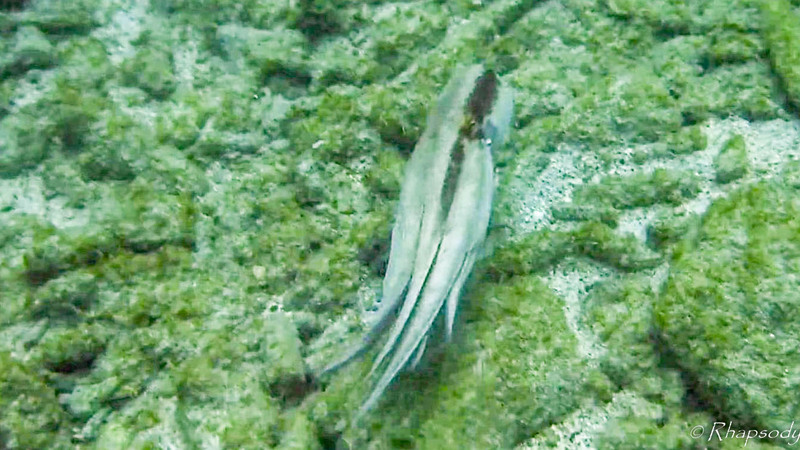 We know it is an octopus, and we are happy to find it, but we always wish we could see more of it. 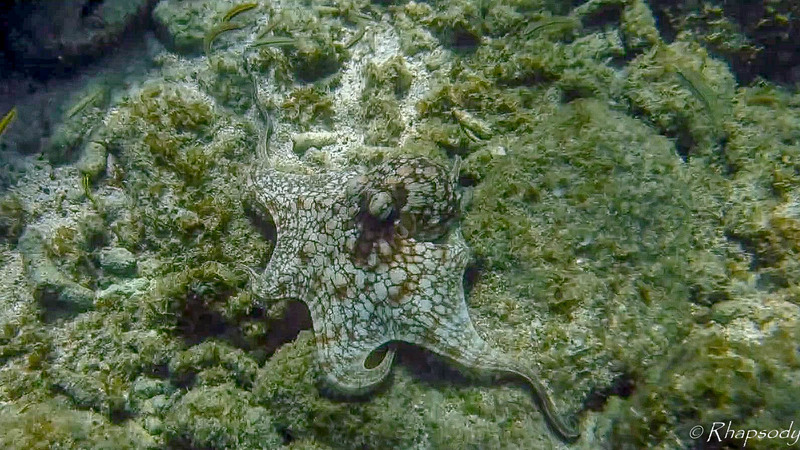 Yesterday we had a more extended look at an octopus. 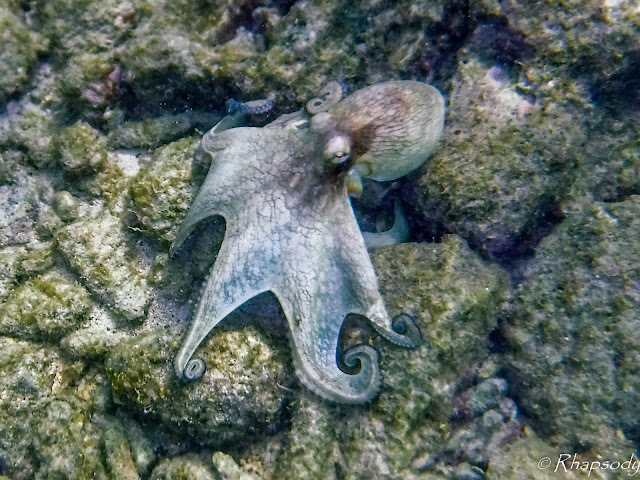 We were snorkeling in the wonderful turquoise water in front of Rhapsody when Bob let out the cry "Octopus!" which will always bring me running (quite a feat while snorkeling). The octopus was out during the day and we were able to watch it for quite some time. *Let's start with the plural. 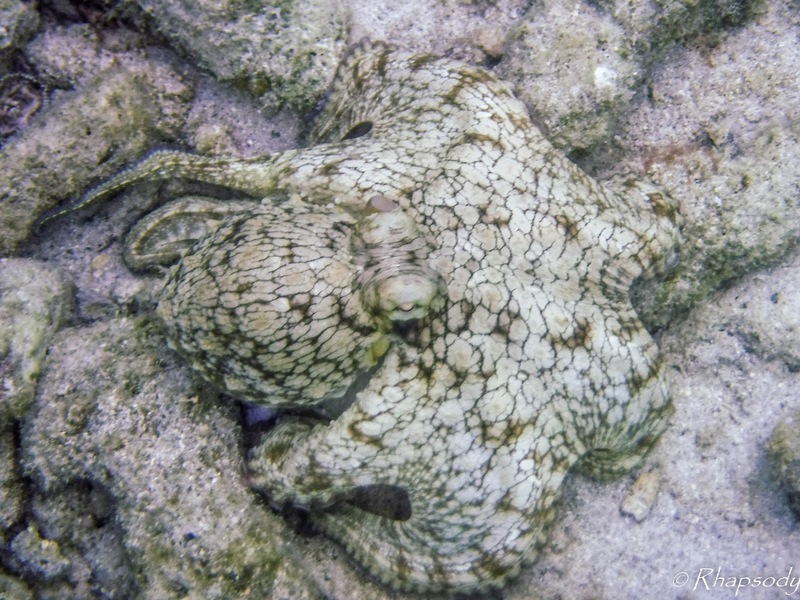 There are three accepted plurals, octopuses, octopi and octopodes. Octopi is probably the most generally accepted, however, according to the Oxford Dictionary, it is grammatically incorrect. *Octopi have a central brain, and in addition each arm has a type of brain so octopuses are very good at multi tasking, and if an arm is severed (it's ok, they grow back) that arm can continue hunting and exploring on its own for several hours! *Female octopodes have suckers all the way to the tips of the arms. On the third arm of the males there is a specialized tip that is used for reproduction. Typically the male keeps this arm curled up and protected. 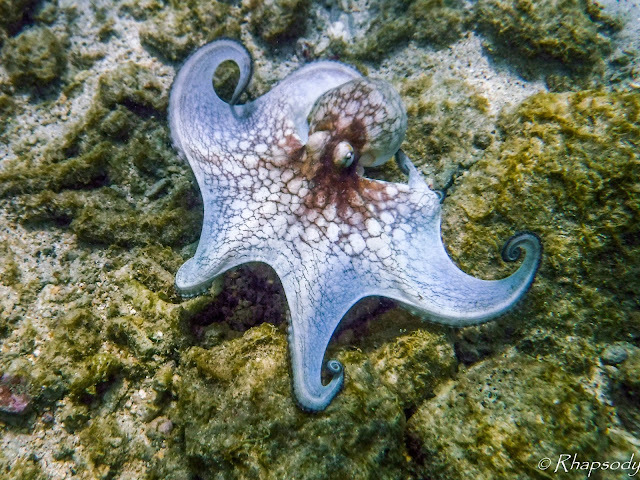 At first our octopus was not very active, but the patterns on the skin were beautiful. Then Bob swam a little closer to it and it began to flare. And both the color and the texture changed. Then the shape changed and it was off and swimming. We followed along for a while as it would settle for a few minutes, and then swim away. When it was stationary its arms were very active exploring crevices wherever it could. It would explore for about a minute, and then take off. On one of the swims it encountered some fire coral, and shied away very quickly. 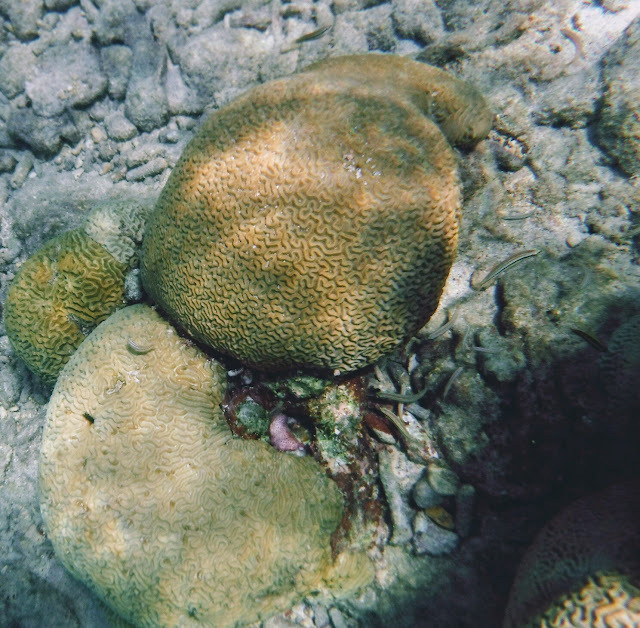 Another time as it was coming to rest it landed almost on top of a small Sergeant Major fish, who took off very quickly in obvious alarm. It is amazing that all these pictures (with the exception of the small pink one in the first picture) are the same octopus. They are masters of change and it is fascinating to watch them. After a while Bob said that perhaps we were stressing it out and we should stop chasing it. Reluctantly I agreed that he was probably right, but they are so wonderful to watch! I took one last video as it was jetting off.